Interested in the latest PPC trends and what it means for your online marketing strategy? 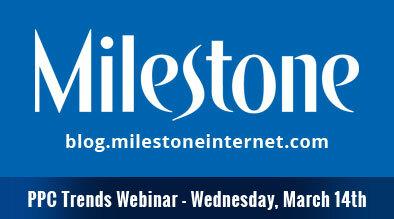 Milestone’s next free online webinar uncovers the PPC topics that continue to dominate the paid advertising space. Sign up today to reserve your spot and learn how to stay ahead in pay-per-click. Milestone Internet Marketing, Inc presents the next in our series of free webinars: 2012 Latest PPC Trends. PPC continues to rapidly evolve to incorporate the latest changes in the social, local, and mobile. In this latest webinar, the Milestone panelists will discuss how to achieve a competitive edge running a mobile campaign, social extensions and advertising in social media channels like Facebook, twitter, and Linkedin, and the secret algorithm behind PPC – the keyword quality score. Register now to confirm your attendance. Click here to Tweet! please verify that i am registered.